Also known as Bonewood, this attractive large shrub or small tree to 3–5 m is found naturally along the edges of dry or subtropical rainforest. The opposite elliptical leaves are aromatic when crushed. 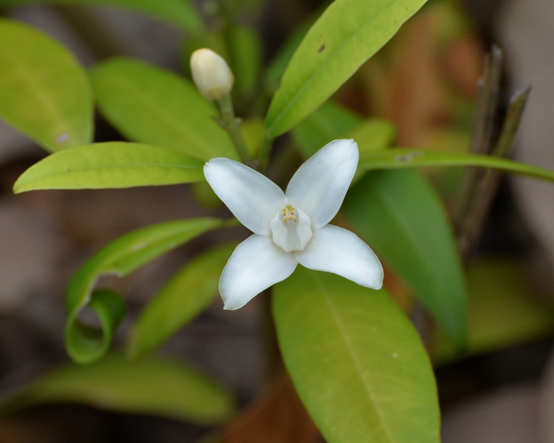 In summer, the distinctive four-petalled white flowers to 25 mm across arise from the leaf axils and are mildly fragrant. These are followed by smaller brown, hairy capsules. This is a hardy local shrub that will tolerate most soils. When grown in full sun or semi shade, Pink Heart has a dense upright habit, so is suitable as an ornamental feature plant or screen in almost any sized garden. The flowers are a distinctive feature throughout summer. Specimens can be found at Day’s Road Reserve in Wights Mountain, and planted at the Samford Eco-Corridor.